Well drained. Tolerates sandy, rocky soils. Rock gardens, retaining walls, edging. Leaves and flowers are edible. Larvae food for fritillary butterflies. Needs sharp drainage. 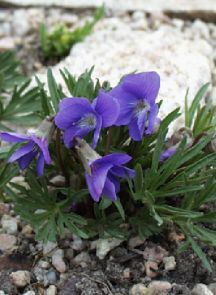 Will self sow but not nearly as much as the common violet. Very charming. Endangered or threatened in much of its natural range.